Client News: Wausau publishes new "Florida Product Guide: Window and Curtainwall Systems Engineered for Protection and Sustainability"
For decades, Wausau Window and Wall Systems' products have addressed the Florida market's specific performance requirements for hospitals, condominiums, office buildings and government buildings statewide. 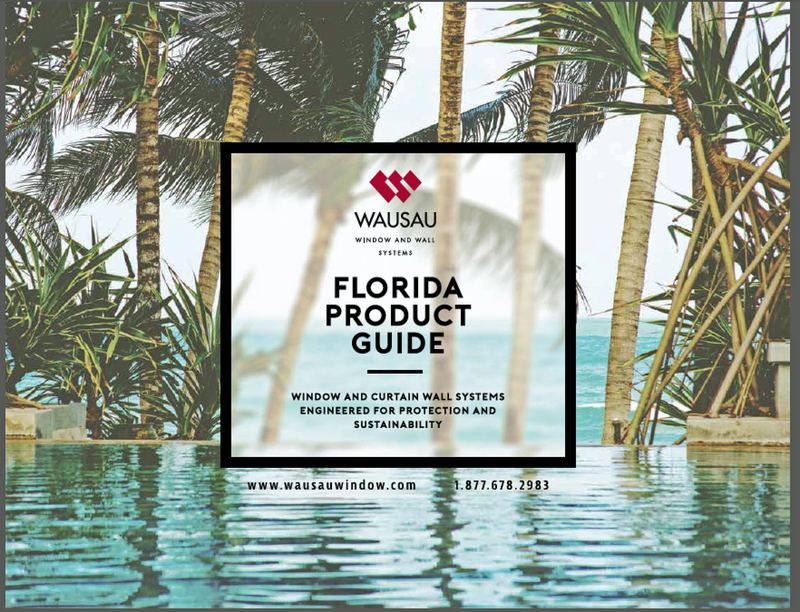 Wausau's new "Florida Product Guide: Window and Curtainwall Systems Engineered for Protection and Sustainability" provides a comprehensive, 143-page reference to these products and their performance capabilities. Florida's climate and weather demand glazing products that are engineered and proven to perform. Wausau's hurricane impact-resistant SuperWall™-HP curtainwall and INvent™ 3250i-HP-XLT, 4250i-HP-XLT and 3250-HP Series casement, projected and fixed windows have been tested to meet missile test standards, such as ASTM E1886 and ASTM E1996, and the applicable Miami-Dade Testing Application Standards. Detailed in Wausau's Florida Product Guide are its windows, window wall, curtainwall and accessories that meet or exceed the Florida Building Code, including those required in High Velocity Hurricane Zones. The guide notes Wausau products that have been granted, or soon will be granted, Florida Product Approvals and/or Miami Dade Notices of Acceptance. In addition to impact-tested windows and walls, the Florida Product Guide lists glazing systems suited to handle Florida's sunshine and heat. ClearStory™ Sun Shades and Light Shelves can be integrated into windows and curtainwall to manage solar heat gain and to harvest natural daylight. INvent windows and SuperWall curtainwall can be specified to provide maximum thermal comfort for building occupants. Beyond Florida-specific testing requirements, Wausau's product portfolio includes a diverse collection of products offering the best in air infiltration and water penetration resistance, energy and condensation performance, noise attenuation, ADA accessibility, and blast hazard mitigation, as well as terrace and patio doors, such as the new 5250i-XLT CrossTrak™ Sliding Doors. A digital copy of Wausau's Florida Product Guide is available at www.wausauwindow.com in the literature section as a downloadable PDF. Please see the website for additional information on Wausau's high-performance products and market-specific applications, or contact us by emailing info@wausauwindow.com or calling 877-678-2983.